We've made it to Day #3 of the Waltzingmouse October Release Sneak Peeks - tomorrow Claire will be releasing all three sets and the Design Team will be having a blog hop to celebrate. Today we are showing you creations made with the third set of the release - Elf Made. I used the Stitched Tag dies for both tags on the card front and the one inside. The heart and star are cut from craft metal using dies from the Folding Tag die set. I colored my little girl elf (who is holding a piece of mistletoe!) with Copics and used a silver Wink of Stella to outline some of the edges on her outfit and to color the bell - it's very shimmery IRL - you can see it a bit in this photo. I used another stamp from the set on the tag inside the card. For my next card - I stamped the sweet little 'kisses' from the set in black and colored them with my silver Wink of Stella. I layered the panel onto a brushed silver cardstock. This card is 4 1/4" x 4 1/4"
Here you can hopefully see the shimmer on both cardstock and kisses. I used another of the sentiments from the set on the inside of my card that coordinates nicely with the kisses on the front! There are tons of stamps in this Elf Made set - I have used just a few of them today - I hope you'll check out the rest of the DT linked below to see what stamps they have used from the set! 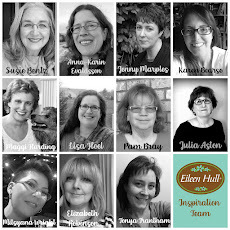 I'll be back tomorrow for the DT blog hop at 2 pm and the new stamps will all be available to purchase! Whoo hoo! Accessories: Maraschino Twine - The Twinery, Linen Ribbon - Idea-ology/Ranger, rhinestones - Kaiser Craft, Dies - Stitched Tag Die and Folding Tag Die (star and heart) - Waltzingmouse, Silver Wink of Stella, Copics - G28, R59, E00, R20, YR24, 100, BG18, foam dots, baby blue craft metal sheet - Add a Little Dazzle. Accessories: foam dots, Wink of Stella - Silver. It's Thursday - and this week there's a new Fusion Challenge - a bright shiny pink challenge! We are also SO very excited to announce that the ever talented Amy Tsuruta has rejoined the Fusion DT! Be sure to welcome Amy when you visit her today! Without further ado here is the challenge! 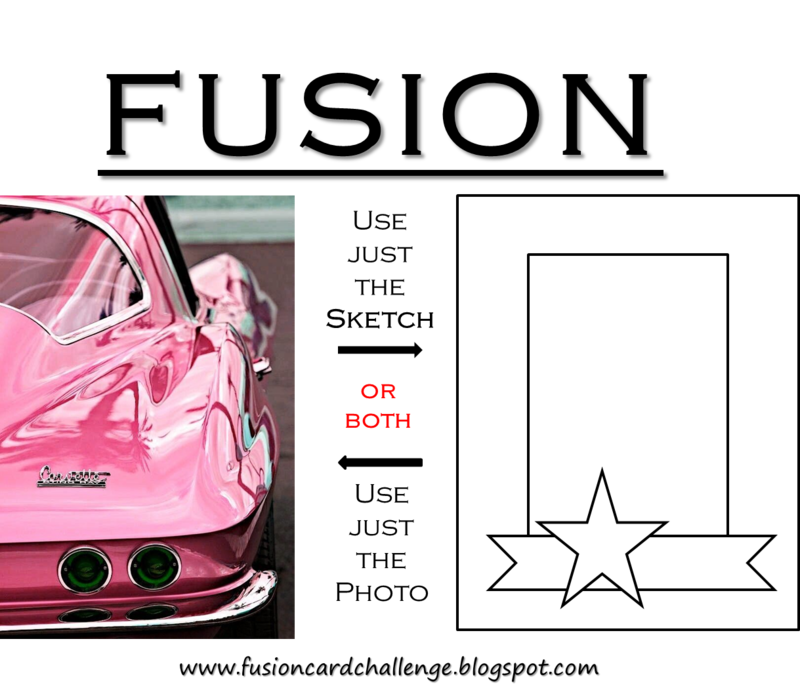 How fun is this pink corvette??!! And look at that nice looking sketch! As you know - you can be inspired by the photo - or the sketch - or combine the two into FUSION! Which is what I did today. Although I tilted the panel and used the car for my star! I cut a piece of Pucker Me Pink craft metal from Add a Little Dazzle for my VW - the stamps and car die are from Enjoy the Ride by PTI. I added some black rhinestones to the rear lights and sprinkled a few sequins around! What will inspire you this week for your Fusion card? Can't wait to see it linked up over at the challenge where you will also find all of the details. Below are the links to the Design Team so you can see what inspired them! Accessories: car die - Enjoy the Ride - PTI, Arrow die - Lead the Way - MFT, foam dots, Sugar Blend Sequins - Avery Elle, Glue N Seal, Pucker Me Pink Craft Metal Sheet - Add a Little Dazzle. Today is my Birthday! Happy Birthday to me! Kent and I will be celebrating tonight at our local Not Your Average Joe's restaurant with a free entree and dessert that I received for my birthday because we signed up to receive e-mail promotions from them. So every year I get a free birthday dinner! I've also received several lovely cards from some stamping friends - Thank You Anne, Evelyn, Vicki, Michelle, Sue and BJ! It's so fun to find home made cards in my mailbox. So moving on to my card - I used dark chocolate craft metal from Add a Little Dazzle for the leaves, cutting them with Stitched Leaves dies from Lawn Fawn. I dabbed Distress Paints on them and dried them with a heat tool. For the embossed panel - I first inked the inside back panel of the embossing folder by rubbing my Old Paper Distress Ink over it - then I put the card stock panel inside, closed the folder and ran it through my Vagabond. See how the ink colors the background but not the raised design?! I just love how the Distress Paints look dabbed onto the metal leaves - my favorite is the mix of Fired Brick and Rusty Hinge on the maple leaf below. Mixed Media Card Challenge - autumn colors with the option of using Metal or Leaves. 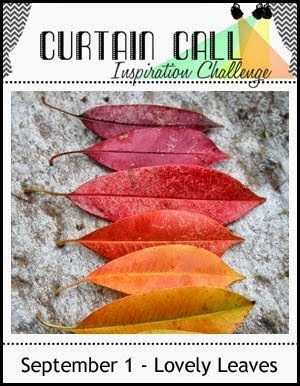 Inspiration Emporium - Fall is in the air. Words 2 scrap by - To Everything there is a season - mine would be fall! And not only is today my birthday - but it's also the beginning of the weekend - whoo hoo!! Have a good one everyone! Accessories: Ranger Distress Paints - Scattered Straw, Rusty Hinge, Fired Brick; Embossing folder - Thankful Background and Borders Set - Tim Holtz/Alterations, Dark Chocolate Craft Metal - Add a Little Dazzle, Stitched Leaves Dies - Lawn Fawn, home made enamel dots made from Perler beads, Glue N Seal - Ranger, Foam dots. 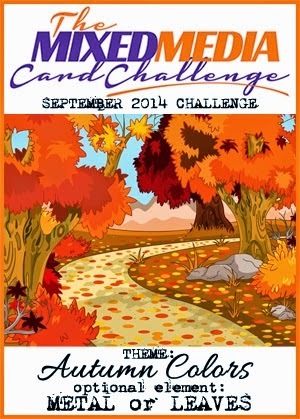 It's the first of the month and time for a brandy new Mixed Media Card Challenge! The theme is Autumn Colors with the optional elements of metal or leaves. Perfect for September for those of us who live in those parts of the world where the seasons change and fall is near! You'll find the challenge here. This month we are teaming up with Add a Little Dazzle - and using owner Monica's craft metal on our cards. The thin flexible metal cuts so easily with your dies - it's a dream to work with! I stamped my panel with Ornate Dots using 3 colors of Archival ink - Red Geranium, Fern Green and Orange Blossom and sponged the edges in Bundled Sage and Wild Honey Distress Inks. I stamped an Art Parts leaf stem with Reverse Dots using the same 3 Archival inks then brushed Distress Crackle Paint over it and let it dry. You can see the wonderful crackle on this photo below. I die cut a piece of Dark Chocolate Brown Craft Metal with Tender Leaves Die, pounced over them with Rusty Hinge Distress Paint layering them over a die cut stitched rectangle. I added a little twine bow and some sequins scattered around the card. The sentiment is from Sweet N Sassy. And once again - a full view of my Mixed Media Card. Autumn colors, metal and leaves! You have until Sept 25th to link up your mixed media card creations - check out all the details here. Remember - we are looking for texture, dimension and techniques! I look forward to seeing your inspiring creations! Accessories: Avery Elle Sequins - Kraft Blend and Lemonade Blend. Stitched Mat Rectangle Die - Lil'Inker Designs, Tender Leaves Die - Memory Box, Ranger Distress Paint Rusty Hinge, Art Parts/Leaves - Wendy Vecchi/Studio 490, Distress Crackle Paint - Ranger, Blending tool, Ranger. foam tape, twine, dark chocolate brown craft metal - Add a Little Dazzle. I finally got a project made for the Compendium of Curiosities 3 Challenge - Faded Layers. 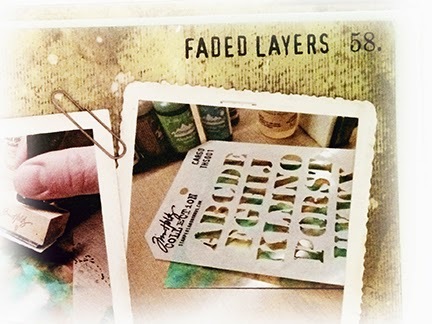 Our challenge is to use Tim Holtz' Faded Layers Technique - which can be found on Page 58 of the Compendium of Curiosities 3. We cannot describe the technique in our post - as the challenge creators request that you work from your own copy of Tim's book. I needed to make a card for my son's long-time girlfriend's birthday - which is today! I've invited them to dinner in our yard on the deck. She loves dragonflies and I'd recently purchased Tim's Dragonfly die so I thought it was the perfect opportunity to use it. And I thought a Faded Layer background would be perfect for it! So I killed two birds with one stone so to speak (although isn't that an awful saying??!!!) I got the card I needed made and I got my challenge project done! My card is a large 6" x 6". First I made my Faded Layers panel using Tim's Technique. I die cut it with Alterations Postage Stamp Die and layered it over a piece of a lovely woven design patterned paper from Idea-ology Paper Stash/Destinations. I die cut the Dragonfly from a piece of Lovely Lavender metal craft sheet and white card stock and adhered them together to give firmness to the metal. Then I embossed them with the dragonfly embossing folder that comes with the die. I rubbed some Autumn Gold Rub N Buff over the metal, added a little piece of black wire for the antennae and black rhinestones for the eyes. I rounded the wings with my finger and adhered the dragonfly to the panel with foam tape along the body. The wings will flatten if pressed - but since I'm handing this to April today - they will stay rounded! Here's a close up of the Faded Layers Panel - I actually used 4 different Stencils on this - Rays, Measured, Splatters and Harlequin. It's very subtle! 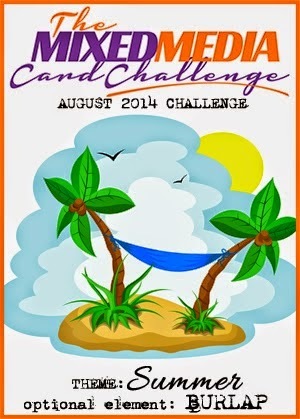 So I hope you will join us in the CCSC#8 challenge - check out all the details here. you have until Aug 25th to link up your card! see all the details here. Paper: Glossy Paper - Ranger, White - PTI, DP - Idea-ology Paper Stash Destinations. Accessories: Stencils - Rays, Measured, Splatters, Harlequin - Idea-ology/Tim Holtz, Lovely Lavender Metal Craft Sheet - Add a Little Dazzle, Alterations Dies - Layered Dragonfly, Postage Stamp Frame, foam dots, Autumn Gold Rub N Buff, black wire, Adirondack Alcohol Inks - Wild Plum, Stonewashed, Butterscotch and Alcohol Blending Solution. If you are looking for my Festive Friday post- please scroll down or click here. Flowers always mean summer to me as I love to garden and then cut the different flowers as they bloom to bring inside to put in vases and jars around the house. I included the optional element of burlap on my card this month since I had a piece in my craft room. I found a great technique for burlap over on Jenny's blog. I covered my piece of burlap with Metallic Gold Embossing Paste which gave it a wonderful shimmer. The paste fills in the spaces between the threads of the burlap and makes the surface more solid. Here you can see the difference between the plain piece of burlap on the top and the piece with Embossing Paste on it. It almost feels rubbery! I used the Hibiscus Dies from MFT to cut the flower, stem and flower center out of Perfect Peacock and Princess Pink Craft Metal Sheets. I used a flower tool to add dots to the flower center and to accent the creases and add roundness to the leaves and petals. They already had some nice creases in them from the dies themselves. The birthday die is from PTI. I adhered the flower to the burlap using pieces of thick foam dots to hold the petals up off the burlap. Here you can see the burlap a little more closely - as well as the layered metal bloom. Here's the full view - one more time! For mixed media - we want to see texture, dimension and techniques. 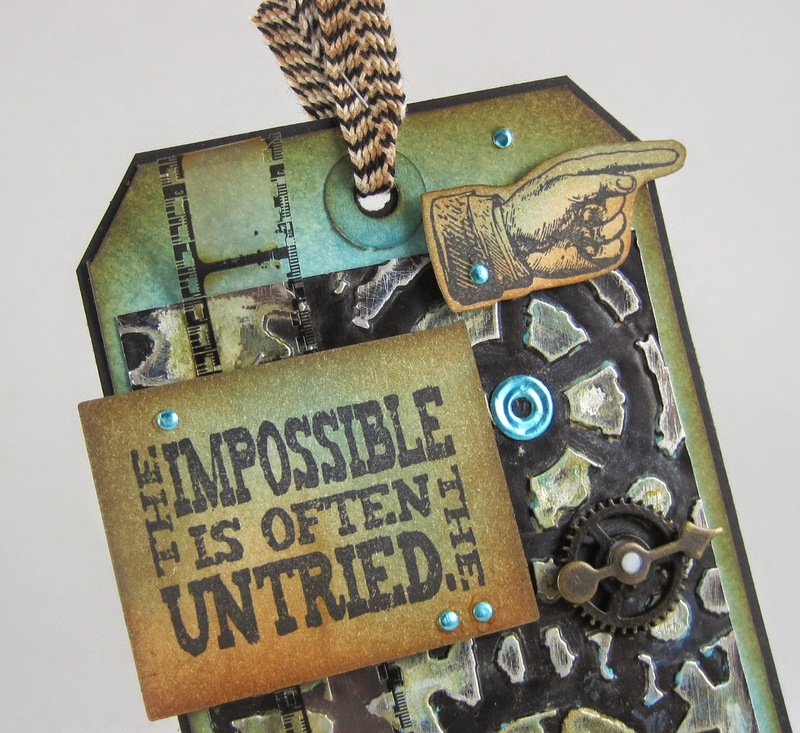 I used a stencil with ink, embossing paste, burlap, craft metal, and die cuts. So get out your summer things, add a bit of burlap if you feel creative and link your Mixed Media Card to the Mixed Media Card Challenge #2 found here! Where you will also find all the wonderful inspiration from the Design Team! You have until Aug 25th to link up. Hope to see you there! Accessories: burlap - Joann's, Metallic Gold Embossing Paste - Wendy Vecchi/Studio 490, mini blending tool, Checkmate Stencil - Wendy Vecchi/Studio 490, Hibiscus Die - My Favorite Things, Wonderful Words Birthday die - Papertrey Ink, Punch Bunch Flower tools, Perfect Peacock and Princess Pink Craft Metal - Add a Little Dazzle. eclectic Paperie and Add a Little Dazzle Blog Hop. Welcome to Day 2 of our exciting blog hop. We have been busy playing with our new products and are having lots of fun. Yesterday we had an exciting line up of designers who showcased eclectic Paperie Products and Add a Little Dazzle Craft Metal Sheets. Today the inspiration continues with more amazing projects. It’s so much fun to see all the beautiful creations and we are excited to share another inspiring day with you. Remember to leave comments for a chance to win an amazing prize. eclectic Paperie is a different breed of craft store, conceived as more than just a place where you can purchase supplies, we believe in the strength of collaboration, in coming together and sharing with like-minded crafters. Our goal is to offer a mixed media marketplace where a generation of artists can congregate, explore, imagine, and inspire one another. Add a Little Dazzle specializes in an exclusive line of craft metal sheets that helps you take your crafting to the next level. Whether you are a seasoned or new crafter, our craft metal sheets will help you create unique projects that will make you stand out among the crowd. 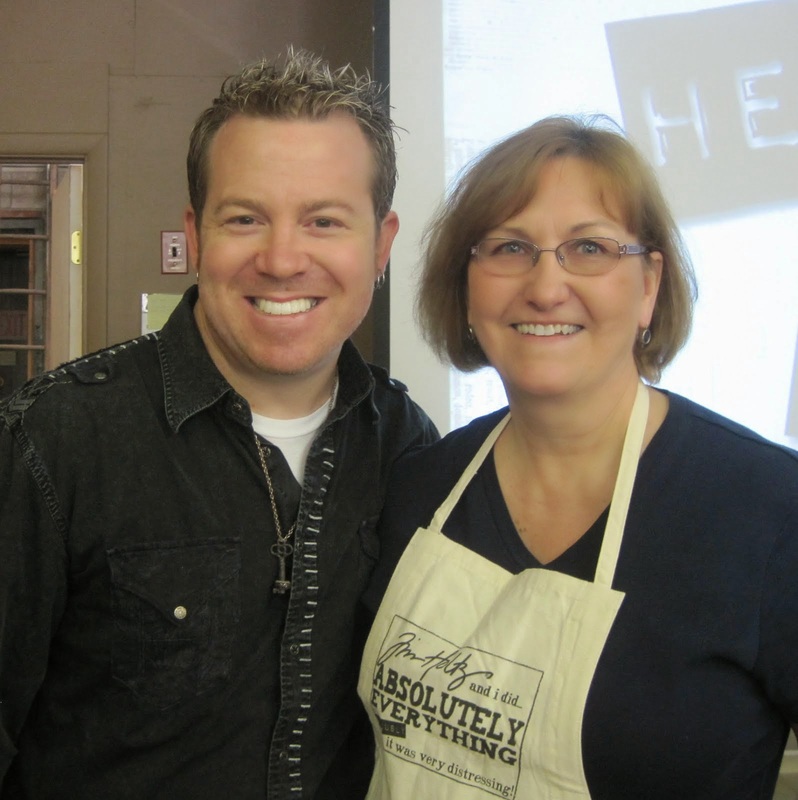 Are you ready to take your crafting to the next level? Add a Little Dazzle Craft Metal Sheets will help you turn the ordinary into the extraordinary. And here is the project I created for today's Blog Hop. A masculine theme tag using two colors of the Add a Little Dazzle metal sheets - Dark Rich Chocolate and Baby Blue. I started with a manilla tag and sponged it with Ranger Distress Inks - Broken China and Vintage Photo. I embossed a piece of the Dark Rich Chocolate metal with a Texture Fades Steampunk embossing folder. I sanded the metal piece with my Tim Holtz sanding grip block and sand paper which took most of the dark brown color off the raised pieces. Then I used Acetone (nail polish remover!) and a Q-tip and rubbed over the raised areas to remove more of the color. Next I rubbed Gold Champagne and Snow Cone Gelatos over the raised pieces using my finger, to give a little color to the piece. When I was happy with the colors - I adhered the metal panel to my tag using ScorTape. I adhered my tag to a slightly larger piece of black cardstock, punched the hole through the hole on the tag and slipped a piece of Ideology Trimmings/Naturals through the hole stapling the ends together near the tag. I sponged over the trimming with Vintage Photo. I stamped images and a sentiment from the Stampers Anonymous set - Steampunk on white card stock, sponged the edges with Vintage Photo and then all over the pieces with Broken China. 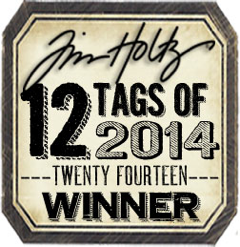 I adhered a piece of Film Strip ribbon to the tag using my Tim Holtz Tiny Attacher. I stapled it a few inches in on each end so the ends curl up a little. I adhered a Mini Gear and Game Spinner with Glue N Seal. Notice the little blue dots and circles on my tag? I made them with a little die that is part of a Tag Set (meant to cover the hole on the top of the tag) from WMS. I die cut them out of the Baby Blue Metal sheet and adhered some circles and the inner dots to my tag with Glue N Seal. A little bit of home made bling! So that's my project - I hope I've inspired you to try out these fun metal sheets on your projects - and I know the rest of the DT participating today will have other inspiring ways to use them - so let's go see, shall we?! 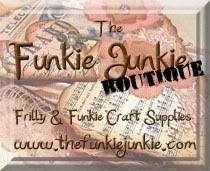 Make sure to stop by and visit each of the Design Team Blogs linked below for a chance to win 1 of 2 prize packages from eclectic Paperie and Add a Little Dazzle valued at $25. You have until Friday, June 27th to leave your comments. The winners will be announced on the eclectic Paperie and Add a Little Dazzle blogs on Saturday, June 28th. 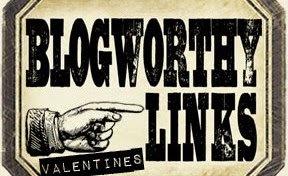 You must leave a comment on all blogs. Visit Eclectic Paperie and Add a Little Dazzle to check out Day 1 of the Blog Hop! Ink: Archival Jet Black, Ranger Distress Vintage Photo and Broken China. Accessories: Sand Paper block and paper and Mini Attacher- Ranger, Idea-ology - Trimmings/Naturals Cream and Black, Film Strip Ribbon, Mini Gears, Game Spinners, Steampunk Embossing folder - Texture Fades Tim Holtz Alterations, Gold Champagne and Snow Cone Gelatos - Faber Castell, Scor Tape, Folding Tag Die - Waltzingmouse, Dark Rich Chocolate and Baby Blue Metal Sheets - Add a Little Dazzle. It's Thursday! 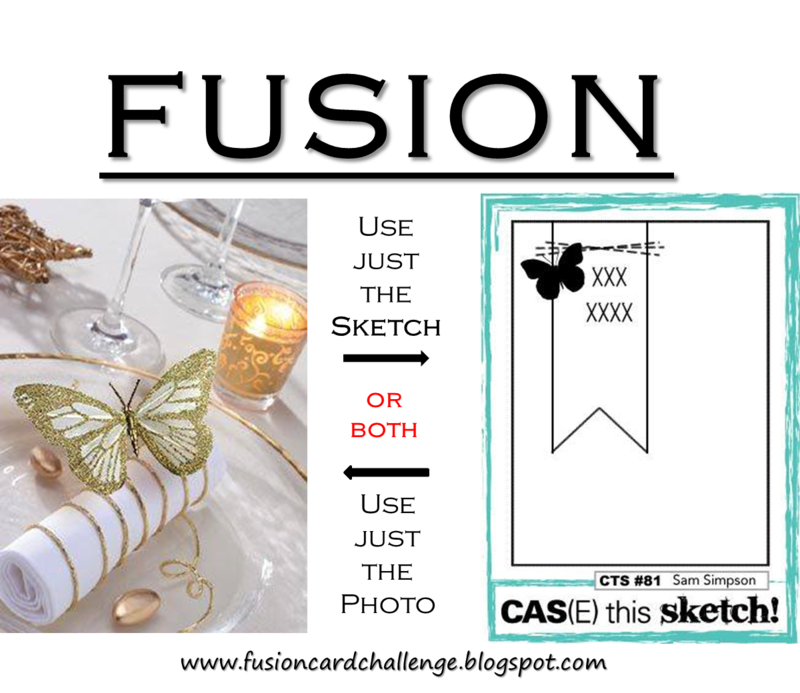 and this Thursday brings a very special Fusion Card Challenge - we are joining forces with Cas(e) This Sketch for your inspiration! 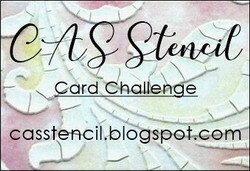 In honor of this joint challenge - I FUSED the image and the sketch on my card! I die cut the lacey butterfly out of white card stock and inked it with Mustard Seed Distress Ink. I covered the butterfly with Glue N Seal and poured Ranger Mustard Seed Distress Glitter over it. I let it dry and then brushed off the excess glitter. I cut the tag with one of the Waltzingmouse Stitched Tags out of a Golden Glimmer Metal sheet. I die cut the heart from Folding Tag Die set from Waltzingmouse and the Birthday die from PTI using a Lovely Lavender Metal Sheet. I adhered all the pieces with Scotch Quick Dry adhesive to the metal tag. I adhered the metal tag to the Stitched Mat Rectangle die cut panel with my Scotch Tape Glider. We hope you will join along in this fun joint challenge! So come along and join us! You'll find the Fusion link up here. Accessories: Lovely Lavender and Golden Glimmer Metal Sheets - Add a Little Dazzle, Word Window Punch - SU, dies: Butterfly - Marianne Createables; Stitched Mat Rectangle Die - Lil' Inker Designs; heart hole cover from Folding Tag set and tag from Stitched Tags - Waltzingmouse; Wonderful Words Birthday - PTI, Scotch Tape Glider, Scotch Quick Dry Adhesive - Michaels.